Duffy and the Devil was written by Harve Zemach. 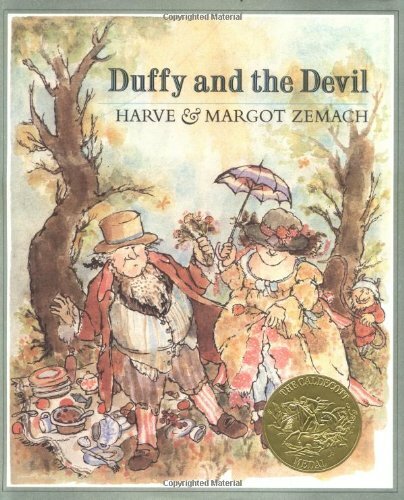 Duffy and the Devil was published by Farrar Straus & Giroux. About Harve Zemach (Author) : Harve Zemach is a published author of children's books. Some of the published credits of Harve Zemach include Mommy Buy Me a China Doll, Salt: A Russian Tale, Duffy and the Devil, and The Judge. This trickster tale is reminiscent of Rumpelstiltskin. It tells how a woman makes a deal with the Devil to do her knitting for her for three years and if she cannot guess his name then she belongs to him. The plot thickens as the years go by, but the tension is released when Duffy’s husband overhears the name and he comes and tells her. Her secret is never revealed to her husband, and she escapes having to come clean. The illustrations are pen and watercolor. The characters are not beautiful and the setting is not grand. The outlines of the drawings are not perfect, and create a busy look. The colors are not bold, just earth tones. From the looks of the clothing, one might assume an early nineteenth century time period. Though it speaks of a devil, the illustrations keep the tone light and humorous.